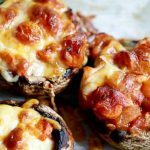 A delicious low-carb way to enjoy pizza. These are incredibly easy to make and customize with toppings of your choice. Bake in the oven for 20 minutes at 375°F (190°C) until cheese begins to turn golden and bubbly.